These were popular in the 1950’s and would have been produced fairly cheaply. Many were well made but they were not quality items. They are usually found in the form of trinket boxes or cigarette dispensers. 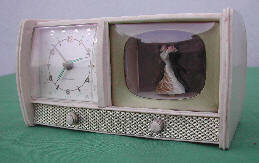 A popular theme was to make them in the form of televisions which, at that time, were still a novelty themselves !! 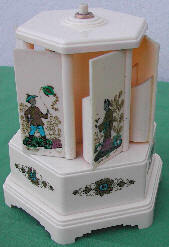 When the musical box was activated, by opening a drawer or lid, whatever is in the “screen” area will start moving. Many use a ballerina or a couple who actually move. The use of mirrors help to create the illusion of a crowded ballroom. Another variant is the gondola which revolves when the lid is raised. The Ballerina dances when the music plays. Radiograms were another popular style with a mock record and arm which, when moved, activate the mechanism. 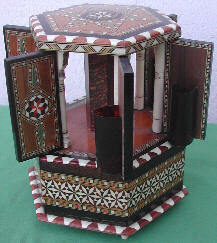 The hexagonal cigarette dispenser made by Seccol is one of the most commonly seen. 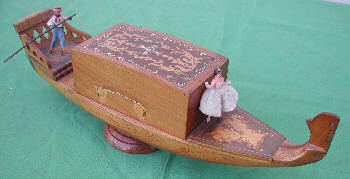 Various models, in different colours and décor, were made, including one with a ballerina in the centre.